Now that it’s officially Fall, it’s perfectly acceptable to cover your porch in pumpkins and hay bales. I love the bright Fall colors you see everywhere, but here in SoCal our Fall is typically 80’s, if not 90’s. It doesn’t usually get quite cold enough to turn our trees to the bright Fall colors you see in other States. But, the leaves definitely Fall off the trees. Since the trees in my yard are still bright green, I’ve got to make my own Fall colors. Today’s project shows off those bright Fall Colors without all the mess. This card uses the new Falling for Leaves stamp set and the new Buffalo Plaid background stamp. I love this new background stamp. I can now make plaid paper in any color. And the detail on the leaves is amazing. I can already tell this stamp set is great is going to be perfect for my Thanksgiving place settings and decor. A small version of this card will be perfect for the name cards on the table. The die cut leaves will look perfect sprinkled around the table and my candle centerpiece. 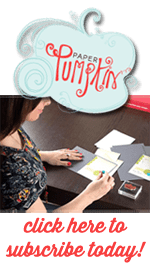 Just when you thought the Holiday Catalog couldn’t get any better, Stampin Up releases a special product just for September. Our Dashing Along Pattern Paper is exclusive to this promotion and will not be available after September 30. This pack of paper is free with any merchandise total of $250 or more (before shipping and handling). Customer, party, or online orders qualify for this free pack of paper. Only one pack of paper can be earned per order, but you can submit as many parties or orders as you’d like. Available while supplies last.